You are invited to contact any of our leaders (Akela) by visiting our "Contact the Leaders" page. If you are interested in signing up or have questions or comments you can also take one minute to fill out our online form. Either way, we are readily available to help answer any questions. On behalf of our Pack -and the leaders - we wish you and your family the very best. 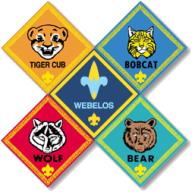 We also hope you will become the next scouting family in our Pack. Thinking about Joining Scouts? Tell Us.